PLAINVILLE - The Plainville Historical Society will host author Marty Podskoch, who will speak about his book “Connecticut Civilian Conservation Camps: History, Memories and Legacy” on May 15. The program will be held at 7 p.m. at the Plainville Historic Center at 29 Pierce Street. The Civilian Conservation Corps (CCC) began in 1933 as a public works program under President Franklin D. Roosevelt’s New Deal. 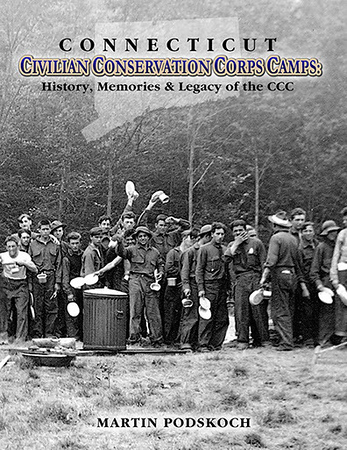 Twenty-one CCC camps were set up in Connecticut towns, state parks, and forests. Workers built trails, roads, camp sites, dams, and fire observation towers. They also stocked fish, fought fires, and planted millions of trees. Podskoch is a retired teacher and author of seven other books. He is also the author of the upcoming book “Connecticut 169 Club: Your Passport and Guide to Exploring Connecticut,” which will cover unique destinations in every town. One town from the book is featured each week in the Weekend edition of the Bristol Press. The Historical Society is also interested in any Plainville connections with the CCC. Those who know the names of any young men who served or have any questions about the program can call corresponding secretary Rosemary Morante at 860-402-3873. Posted in The Bristol Press, Bristol, Plainville on Wednesday, 9 May 2018 21:00. Updated: Wednesday, 9 May 2018 21:02.